More than 17 percent of Canadians have been diagnosed with high blood pressure, a condition that makes it more difficult for the heart to pump blood around the body. At first, heart muscle grows to meet the challenge, but eventually this growth becomes dysfunctional, leading to heart failure. New research led by Dr. Lynn Megeney provides crucial insight into what controls the transition from heart growth to heart failure. Good heart growth starts with activation of a protein called caspase 3, which regulates a variety of processes by cutting up other proteins. But if caspase 3 stays active for too long, it cuts up a protein called gelsolin, which results in heart muscle cells becoming rigid and dysfunctional. Blocking the interaction between caspase 3 and gelsolin blocks the bad kind of growth in heart cells and preserves heart function. This research could lead to a novel approach to prevent heart failure. See the Journal of the American Heart Association for details. 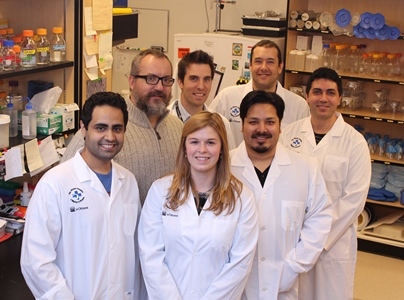 “These are exciting observations and suggest that designing drugs to block caspase cutting of gelsolin may provide an effective means to prevent heart failure,” said Dr. Megeney, senior scientist at The Ottawa Hospital and professor at the University of Ottawa. Authors: Putinski C, Abdul-Ghani M, Brunette S, Burgon PG, Megeney LA. Funding: Dr. Megeney’s research is possible because of generous donations to The Ottawa Hospital Foundation. This study was also supported by the Canadian Institutes of Health Research and an Ontario Graduate Scholarship.